^ Paul Krugman. 1999. "Incidents from My Career". Website of Massachusetts Institute of Technology. Accessed on 22nd February 2015. ^ a b Krugman, Paul 2009. "The Increasing Returns Revolution in Trade and Geography." American Economic Review, 99(3): 561–71. ^ The Gramm connection. 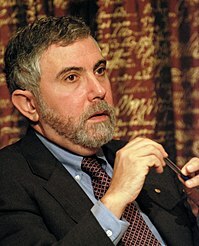 Paul Krugman. The New York Times. Published March 29, 2008.